Mercedes-Benz is committed to the electric vehicle technology. 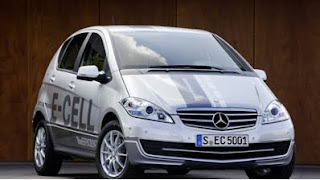 Following on the heels the successful B-Class F-Cell fuel cell car, the A-Class E-Cell is giving Europe a locally emission-free electric drive. With two lithium-ion batteries giving a range of up to 200 km, the A-Class E-Cell is poised to make its mark in the European market. While it's not slated for the US market, we're excited to see new strides in fuel efficiency!